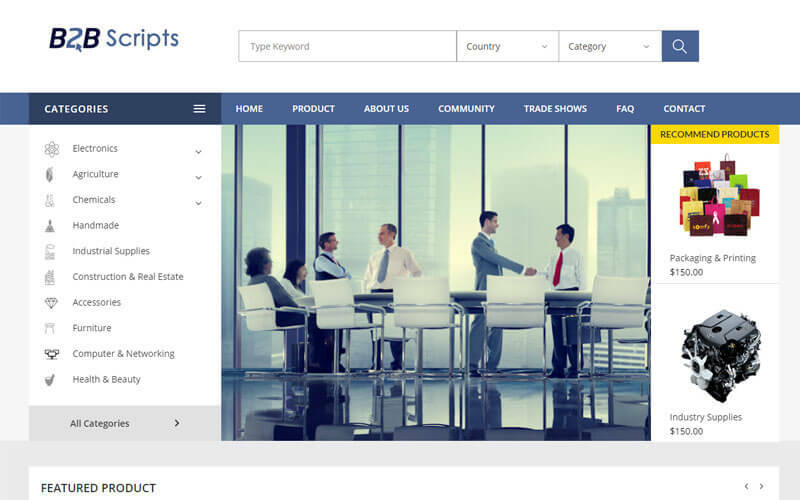 B2B Marketplace Classifieds Trading Script is advanced B2B Marketplace which helps you to start B2B Trade Portal Online in an independent platform. It helps you to flow over radically foremost in the revenue making functionalities in just one place. Our Tradeindia Clone Script has reached completely global areas to manage their whole online business with a capability of run in the medium of throughout the entire universe. Our B2B Multi-vendor Marketplace Scripts are series of benefits for both buyers and sellers from the marketplace. By using this script, they can effectively automate their products in the process of that reduction of reputation in single seller by requesting quotes and bids from different sources by issuing the request looks satisfied for the buyers up to they find the best trader for their project. Bound from the beginning to end in Globalsources Clone Script there is no representative for the lead state of being active towards their customers and not wasting time between their order placements to the delivery. In this PHP Tradeindia Script supports multi-language shows the selling and the buying leads in the home page that clients can login in the frontend and approach the search of products to utilize our Opensource Globalsources Script advanced search by means of keyword, country, state, and category further get the company information then do the inquiry which is incorporate easier with back-end administrator panel by Admin. For the products sellers, it is the place to post the leads to the attention from the buyers by the category and details of inquiry option for even the small enterprises. Our Dhgate Clone Script facilitates better structure management to the seller and buyer into consideration by the admin by its feature-rich panel that holds the control of the users in the site and detailed statistics of the revenue earned by hot listings and membership plans. Readymade PHP Diytrade Script is extremely user-friendly for the search engine ranking to our client website by the way we developed based on the more potential in traffic generation SEO algorithm. It is an OpensourceDhgate Script so we provides our clients with the flexibility in customization from our source code on the global platform. In Diytrade Clone Script substantial concern is that we maintain the personalized touch with our clients that the script is customized as the need of yours and we speed up the entire customization procedure and deliver a good quality product to you within the notified clock. The basic b2b script was handy in making alive my website. I’m very thankful to the technical support team. They helped a lot to get my website into live with what I actually expected. GREAT The support services were quick. In fact I’m not a new customer for PHP Scripts Mall . Already I have purchased a couple of products, It was a great experience collaborating with the development team. There was a good rapport between developers and me. They understood my ideas and implemented my project the way I wanted. Fulfilled my requirement thank you team.